You can dive right into the sanctuary without getting wet - here's how! 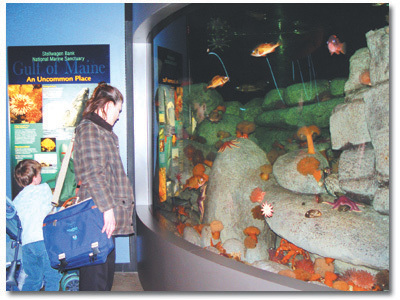 Click here to go to our Visitor Centers page.The sanctuary provides support and/or educational resources to several exhibits in the region, from traditional displays of living species in Boston and Woods Hole, to high tech centers with informational kiosks in Provincetown and Gloucester. Click here for our Video Gallery and take a virtual tour of the wreck of the steamship Portland. Voyage to the seafloor to see a goosefish waving its lure and redfish congregating at another wreck site. Watch the track of a feeding humpback whale.